Baron Arthur de Schickler [1828-1919], Paris, and Martinvast, Normandy (near Cherbourg), by 1896; by inheritance to his daughter, Marguerite, Comtesse Hubert de Pourtalès [1870-1956], Paris, and Martinvast, Normandy; sold April 1919 to (Duveen Brothers, Inc., London and New York) in part-share agreement with (Wildenstein & Co., Inc., New York) and (Arnold Seligmann & Co., Paris); full ownership acquired 1922 by (Wildenstein & Co., Inc., New York); Clarence H. Mackay [1874-1938], Roslyn, New York, by 1924; probably acquired from Mackay by (Duveen Brothers, Inc., London and New York); sold 1939 to the Samuel H. Kress Foundation, New York; gift 1943 to NGA. Bernard Berenson, The Florentine Painters of the Renaissance, New York and London, 1896: 187. The Baron's daughter, who married Comte Hubert de Pourtalès in 1890, was her father's sole heiress. Edward Fowles (Memories of Duveen Brothers, London, 1976: 102-103, 134) discusses the original purchase agreement with Wildenstein and Seligmann for some of the works in the Schickler collection, and the subsequent agreement in 1922 that divided the works among the three dealers. The record for the painting in the "X Book" confirms the 1919 purchase and the fact that it was "taken over by W/Stein" (copy in NGA curatorial files; X Book, Reel 422, Duveen Brothers Records, accession number 960015, Research Library, The Getty Research Institute, Los Angeles). Loan Exhibition of Early Italian Paintings in the Possession of Notable American Collectors, Duveen Brothers, New York, 1924, no. 18, as Virgin and Child by Andrea del Verrocchio (no. 11 in illustrated 1926 version of catalogue). Valentiner, W.R. The Clarence H. Mackay Collection. New York, 1926: 1, 3, no. 3, repro. Duveen Brothers. Duveen Pictures in Public Collections of America. New York, 1941: no. 71, repro., as by Andrea del Verrocchio. Preliminary Catalogue of Paintings and Sculpture. National Gallery of Art, Washington, 1941: 210-211, no. 502, as by Verrocchio. Book of Illustrations. National Gallery of Art, Washington, 1942: 250, repro. 205, as by Verrocchio. Frankfurter, Alfred M. The Kress Collection in the National Gallery. New York, 1944: 31, repro., as by Verrochio. Paintings and Sculpture from the Kress Collection. 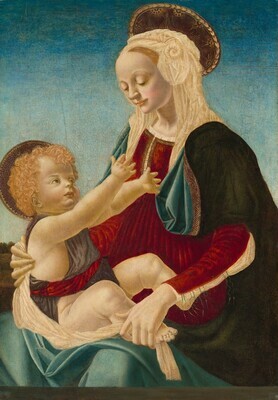 National Gallery of Art, Washington, 1945 (reprinted 1947, 1949): 53, repro., as by Verrocchio. Shapley, Fern Rusk. Paintings from the Samuel H. Kress Collection: Italian Schools, XIII-XV Century. London, 1966: 118, fig. 322. European Paintings and Sculpture, Illustrations. National Gallery of Art, Washington, 1968: 123, repro. Shapley, Fern Rusk. Catalogue of the Italian Paintings. 2 vols. National Gallery of Art, Washington, 1979: I:534-535, II:pl. 370. Boskovits, Miklós, and David Alan Brown, et al. Italian Paintings of the Fifteenth Century. The Systematic Catalogue of the National Gallery of Art. Washington, D.C., 2003: 671-674, color repro.